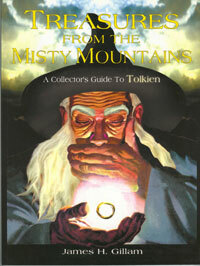 "Treasures from the Misty Mountains: A Collector's Guide to Tolkien" (2001) by James H. Gillam, published by Robert Godwin's Collector's Guide Publishing. I first encountered hobbits in 1968. I suppose I must have been caught in the backwash of the whole "Gandalf for President" thing. I was studying in an environment which Tolkien would have readily recognised, a boarding school dedicated to sending every last student to Oxford and less than an hour's drive from his hometown of Sarehole. In 1972 I was in charge of running the college theatre when I was informed that Donald Swann would be performing a concert. I was asked to entertain him for the duration of the afternoon before his performance. Swann was important in the world of Tolkien and I was fully aware of this. If you check the bibliography found at the beginning of just about any Tolkien book, his is the only name to appear alongside Tolkien's. Swann had become good friends with Professor Tolkien and in the late 1960's the two had worked closely on setting Tolkien's songs to music. At this time Swann was tremendously successful. He had toured the world for many years with his partner Michael Flanders and his reputation lent a solid credibility to the music which subsequently appeared in the book The Road Goes Ever On. I spent the entire afternoon with Mr Swann, drinking tea and listening to music. He was an authentic gentle man with an overflowing talent. We talked about his experiences with Professor Tolkien and his insights gave me a much better understanding of the great mind at work in The Lord of the Rings. As I was young, and somewhat keen to impress, I asked Mr Swann if he had heard a song called "The Battle of Evermore" from a new album by the rock group Led Zeppelin. I was a big fan of the band and I was eager to hear this learned man's impression of my favourite rock group. To my complete surprise he sat and listened to my tape and expressed his approval, noting that the group seemed to have an intense appreciation of musical dynamics. After his concert that night--at which I believe he played "The Road Goes Ever On"--I immediately wrote a letter to Professor Tolkien. It was filled with questions which undoubtedly did not meet with much approval since Mr Swann had told me how the Professor was becoming disturbed by the hysteria growing around his trilogy. To my complete surprise I received a short reply from Professor Tolkien which of course only spurred me on to new heights of enthusiasm. Sadly the next year I was stunned with the news of Professor Tolkien's death. After some months I wrote a letter to Allen & Unwin asking what was to become of The Silmarillion. I still have the reply which outlines how Christopher Tolkien was working to finish his father's last great work. Since those days I have read The Lord of the Rings an ungodly 29 times. I truly love the book and almost miss the characters if I don't revisit them once in a while. Perhaps Professor Tolkien might forgive me my obsession if he knew that I have developed a love for literature in great part due to his genius. I now read voraciously and not just works of fantasy. Never being satisfied with knowing only part of the story I applied my obsessive compulsive behaviour to becoming a writer and a publisher. I became something of an expert on Led Zeppelin (a dozen or so books on the subject) and I developed casual friendships with some of the great writers of fantastic fiction such as Michael Moorcock, Robert Sawyer, Arthur C. Clarke and David Brin. I am now a full-time publisher and every day I use the English language to make my living. I am greatly indebted to Professor Tolkien for opening my eyes to the elegance and strengths of our language and how in the right hands it can be used to convey powerful and beautiful ideas. When I first heard that someone would be attempting to make movies of his great work I was extremely cautious. To my utter amazement I have been surprisingly delighted with Peter Jackson's work. Even though the writers have taken many liberties, I believe the original heart still gleams through and I think that perhaps the best compliment I can pay Jackson is--I don't think it could have been done better.